Earlier this year one of our coaching Associates, Chris Budd of Ovation Finance Limited, sold a majority stake in his business to an Employee Ownership Trust. As he launches an online programme to help other companies follow in his footsteps, he outlines why this revolutionary route to succession planning will be of interest to many business owners. What is the reason for your business? One of the reasons that business owners particularly benefit from coaching is that it provides time away from working in the business to look up and make plans for the future. One area that many owners fail to plan for sufficiently is how they would like their entrepreneurial story to finish; how are they going to exit and (hopefully!) extract value. Exiting a business is complicated and the options are often not particularly palatable. Many owners will have a vague notion that their team will one day take over, without actually discussing it with them, or checking if they have the finances to achieve this. There is also the problem that those who do have the money to buy out the owner are not necessarily the ones that they might choose to run the company. The payment for the shares will come from future profits, and yet the business might be lumbered with a management team made up only of those who could afford to buy in. The Employee Ownership Trust (EOT) is a new way of selling your business which can provide everyone with what they want. This is how it works: rather than being owned by an individual, the shares are owned by a trust fund (the EOT). The beneficiaries of this trust are the employees (think John Lewis). This means that the profits from the business go to the employees via the EOT. In order to get to this position, the owner sells their shares, at an independently valued market price, to the EOT. The EOT then uses the future profits of the business to pay the owner, with any extra going to the employees. If the payment schedule agreed by the owner allows, this means that the employees are incentivised by potentially receiving any profit earned above the annual payment (and all the profit once the earn out is complete). They also have a voice in the running of the business – something many employees value more than the bonus. Oh, and the payments to the owners are exempt from Capital Gains Tax. The EOT is an HMRC scheme that has only been around since 2014. It offers owners a way to exit and yet still leave a legacy, and for employees to access profit and take control of the business without having to come up with any money. For the owner, however, being paid out of future profits may seem a little scary. It is for this reason that I wrote the book The Eternal Business, and have now launched the online programme. I had spent many years making changes to Ovation to get it ready for the day that it would no longer need me. I realised that, in order to one day leave the business, I needed to make myself the least important person within it. When the day came to sell the shares to the EOT, the business had already been working for some time without needing me. The changes I made over the previous years meant that I could leave feeling confident that the company could continue to generate the profits it would need to buy me out. At the same time, the employees now have a genuine say in the running of the business, and will receive a share of the profit in the future. The Eternal Business Programme is an online tool with consultancy support available. It provides a pathway for companies to prepare for the day when the ownership changes. It involves building the company in a way that engages employees, creates genuine purpose, and gives the employees a voice. The programme comes in three courses. Course 1 is to help owners decide if the EOT might be right for them, and then prepare to make the announcement to the leadership team. In course 2, the leadership team and owner then prepare the company to begin the transition, and in course 3 everyone gets behind the move towards the big day. This process can take several years, indeed this may well be advantageous as the transition involves cultural shifts for all parties. Remember, the owner needs to feel comfortable that they are able to walk away confident that the company will thrive without them. The programme provides all the steps necessary to make this happen. If you are an owner who has not made a clear succession plan, I strongly recommend you investigate the EOT. Indeed, even if you are an owner who has made a succession plan, you should still look at the EOT as it may offer a better solution. 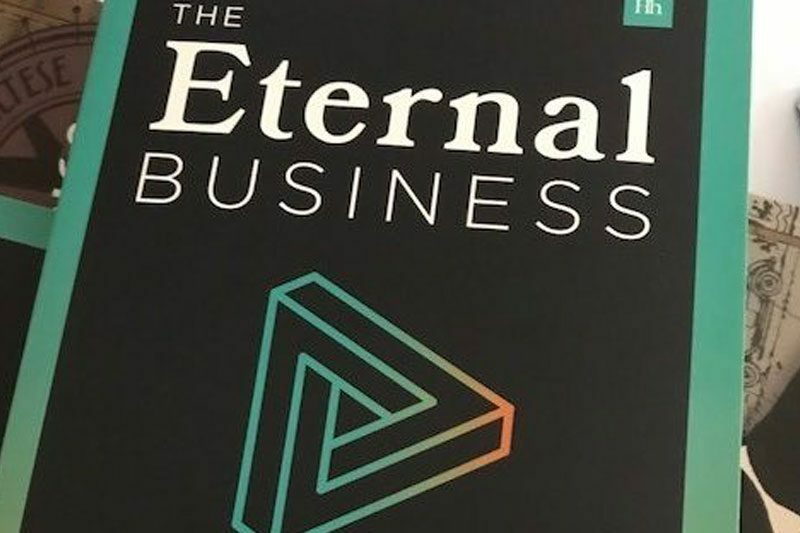 If you would like more information about the EOT, you can visit the Eternal Business website or contact Chris directly at chris@theeternalbusiness.com. To sign up to the programme, visit here.